I’ve had the good fortune of working with many species of terrestrial Hermit Crabs, including the unbelievably huge Coconut Crab (Birgus latro). Most are surprisingly long-lived – for example, the species most commonly sold in pet stores (the Caribbean Hermit Crab, Coenobita clypeatus) can survive for 20 or more years if properly cared for! We’ve learned a great deal about Hermit Crab captive needs over the years, but serious mistakes are still commonly made when it comes to hermit crab substrate choice. The ability to successfully molt and form a new exoskeleton, and to survive the attacks of cage-mates during this dangerous time, hinges upon the substrate. Even if all else is perfect, Hermit Crabs will expire long before “their time is due” if they do not have access to appropriate substrates of the correct depth. As Hermit Crabs grow, they molt or shed their exoskeleton (the body’s hard, external covering) and replace it with a larger one. The old exoskeleton, an important source of calcium and other minerals, is consumed. 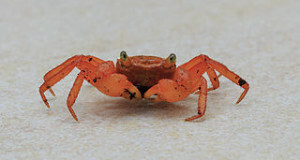 After molting, crabs are soft and unable to move for varying lengths of time. Predators of all types consider these moist, defenseless crabs as the ultimate in gourmet meals. The scents released by molting crabs are nothing short of a dinner bell to other crabs…including cage-mates with whom they have peacefully co-existed for years! Prior to molting, Hermit Crabs burrow into the soil or sand. In natural habitats, this most likely helps to lessen telltale scents and to physically conceal them from predators. The strategy also works well in captivity, although in close quarters some molters may be found and consumed. Even the smallest of Hermit Crabs should be provided with at least 6 inches of moist substrate. Hermit Crabs of ping-pong ball size should be kept on 8 inches of substrate, and the depth should be increased accordingly for larger animals. This differs radically from how most are displayed in stores, I know, and represents a real disservice to customers (and, of course, crabs!). An equal mix of Zoo Med Hermit Crab Sand and Coconut Fiber is ideal for Caribbean Hermit Crabs (Coenobita clypeatus), Ecuadorian Hermit Crabs (Coenobita compressus) and the several Asian species that commonly appear in the pet trade. The mixture holds together well, supports burrows, and is easy for the crabs to manipulate. I also favor the Hermit Crab Sand because it is fortified with calcium, which will be consumed by your pets, especially just prior to molting (please also see “Nutrition”, below). If you keep the substrate slightly moist – wet enough so that it barely clumps together when squeezed by hand –your crabs will be able to dig down when necessary. They will also enjoy sorting through the soil/sand mix in search of food. You can encourage them to become more active by burying Hermit Crab pellets and other treats just below the surface. When I first began keeping Coconut Crabs at the Bronx Zoo in the early 1980’s, we didn’t realize just how long molting crabs needed to remain below-ground – up to 6 months for those behemoths! Today, many crab enthusiasts are surprised to learn that the average “pet-sized” Hermit Crabs remain buried for at least 2 weeks – and often up to 1 month – when molting. Well-meaning owners who do provide deep substrate sometimes dig-up their pets out of concern – this always ends badly! Medium to large Hermit Crabs may remain underground for 2-3 months when molting. Hermit Crabs must consume calcium-rich foods and calcium supplements in order to produce strong exoskeletons. A variety of salts are also used in the shedding process, to help split the old exoskeleton (please post below for details); access to salt water appears critical to their long term health. Please see this article and check out these Hermit Crab Care Supplies for further information, and be sure to post your questions and observations below. Terrestrial Hermit Crabs start life as microscopic, ocean-going larvae…and the story of how they change and wind up on shore – often many miles from where they started out, is still being unraveled. Please see the article linked below to read more about these fascinating creatures. Are wood chips good to put as a floor over the substrate for my crabs. If so what type. I love my crabs and don’t want to use something that can cause them problems. Thank you! Love your website!! Thank you. I have read your article. I do have the crabsand and coconut fiber,8 inches deep . My crabs are thriving. I have seen some crabitat a with some wood chips on top. Didn’t know if that was wise. Do you recommend a type of moss that’s best for them. First of all I would like to say that I have been browsing your blog the last couple days, and I find your posts to be very informative. It is really great to have a professional of your background sharing your knowledge with the pet keeping community. I do have a slight disagreement with your recommendation for hermit crab substrate though. 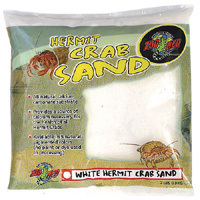 I agree that it is one of the most important things you can provide for pet hermit crabs, but other crab keepers I have learned from have had bad experiences with these types of calcium sand sticking to crabs, and hardening quite a bit as part of the substrate, making it difficult for crabs to burrow. I’ve also heard of these hardened lumps of calcium sand getting stuck in a crabs shell and damaging their soft abdomen. I personally have three C. clypeatus hermit crabs. I have had them for nearly a year, and they have each molted successfully several times with me. Following the advice of experienced hermit crab enthusiasts I have used a mixture of play sand (like that used for children’s sand boxes) and coconut fiber for my substrate. As far as calcium supplementation goes, I use a variety of things for this, including crushed oyster shell (sold as a supplement for chickens), cuttlebone, and calcium dust meant for dusting insects for reptiles. Thank you for opening these types of discussions! Thanks for the kind words and useful observations, much appreciated! 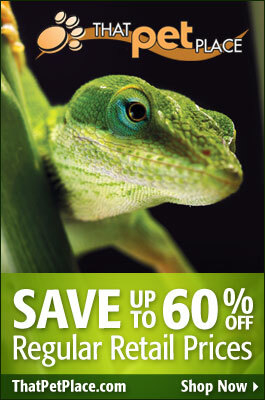 2012’s New Species – Spiders, Roaches, Millipedes, Wasps – Which is your Favorite?